a bride or forfeit his Throne to an evil Count. Filmed At: Screen Gems Studios 6 & 7, Hollywood, CA. Teleplay by Gerald Gardner and Dee Caruso; Story by Peter Meyerson. �Mary Mary� Written & Produced by Michael Nesmith. The Monkees attempt to audition for a gig at an Embassy Ball which they read about in the papers. David thinks its ridiculous, but Michael believes they must take whatever lead is available to them, since gigs have been elusive of late. Count Myron's aide Max brings David inside the ballroom to confront him. He mistakes David for Prince Ludlow of Peruvia, until the real prince enters�who happens to be David's exact double! Prince Ludlow of Peruvia tells David that, according to the terms of His Nation�s Constitution, if he isn't wed by his 18th birthday, the Peruvian throne will go to Count Myron but he's too shy around women. Meanwhile, the scheming the Count and Max, as they fence, are impressed by their plot to Keep Ludlow Single by keeping him away from all women and the ones who pay no mind to them will be driven off by The Prince's Shyness. Furthermore, Myron tells Max he has told Wendy Forsythe, who met Ludlow on The Riviera and took a liking to him, that The Prince was A Sly, Malicious, Sadistic Pathological Liar, in hopes of discouraging her from marrying him. 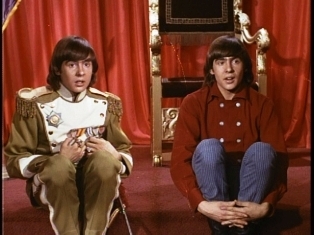 Micky, Michael and Peter enter the room and are also at first confused by David and his look-alike Prince Ludlow. When the Courtier, an old man who has a habit of breaking his cane, announces Wendy Forsythe; too shy to meet her, Ludlow asks David to impersonate him. The other Monkees agree, and they help Ludlow switch places with David to win the girl over since David's good with women. After switching outfits, the other three hide with Ludlow, when Wendy enters to break it off with him but David as the prince manages to woo her and win her over. After she leaves, the Prince asks David to continue to impersonate him for a few more days until she agrees to marry him. Max who overheard David as The Prince charming Wendy, phones the Count to tell him of his concerns the plan will backfire! Meanwhile, Michael decides to stay on with David as his guard since he doesn't trust The Count (and with good reason!) while Micky and Peter take The Prince back with them to their beach pad where they'll teach him the fine art of dating by using a pretty blonde named Gloria. Later, Max intercepts a letter from Wendy declaring her love for Ludlow, and fearing their plot will be foiled, the Chemist coerces him to poison The Tip of His Foil when he gives The Prince his dueling lesson. During the ensuing lesson, David and Max with the poison foil begin to fence until David and Max ends up dropping their foils. When David takes the wrong foil, Max flees when he realizes his opponent has The Poison-Laced Weapon. A confused David takes The Foil to a plant which shrivels, and Michael and David realize Max intends to kill The Prince. Convinced that he must act fast, David proposes to Wendy when she arrives again and she consents, and David tells The Count of their impending marriage and to hold a reception that night before sending him off. Michael arranges by phone for The Prince to come to The Embassy for The Wedding, unbeknownst to him that Count Myron is seeing through The Plot. Later, Michael and David are waiting for The Prince to arrive so they can switch back before the wedding but their plans are ruined when Count Myron presents Micky, Peter and Prince Ludlow, all held at gunpoint by Max. The Count then has Ludlow thrown into The Dungeon and orders The Monkees to leave The Embassy or be killed which convinces them to storm off. At the church as the wedding is about to begin, the Count arrives with bad news about Ludlow being summoned away to Peruvia on pressing affairs of state, and is about to call the wedding off until David, still disguised in Royal finery as The Prince, whom he coerces to stall The Ceremony while Micky and Peter help The Prince escape from The Dungeon. At The Dungeon, the prince tries unsuccessfully to get the jailer to release him by offering a letter of credit until Micky and Peter arrive and manage to subdue the jailer. Meanwhile, Michael stalls the wedding with a nonsensical tirade until he�s interrupted Micky, Peter and the real Ludlow, who suddenly appears and takes David�s place. Through the musical romp of �Mary, Mary�, The Monkees fight off Count Myron and Max as Prince Ludlow marries Wendy; the guys wrap it up by roping the 2 villains cowboy style. The now married Prince then orders the two to be arrested. When the furor dies down, David asks Michael if he thinks Wendy�ll be okay with Ludlow, since it was he whom she was in love with, and Michael quotes a philosopher, Ling Fu Ying, who lived 5000 years ago: �If apple seed turns to wing, it�ll fly away a beautiful butterfly, but if a butterfly turns into apple seed, it�ll just lay there on the ground.� Asked by David what it means, Michael states he has no idea! The next morning at the pad, the group reads of The Couple's Honeymoon in Greece and Wendy Forsythe going to the University of Peruvia to work on her Doctor's Thesis (Peter quips, "Why can't her Doctor work on His Own Thesis? "), while David bemoans losing Wendy whom he'd became smitten with while he masqueraded as Prince Ludlow. After the others leave, a female reporter from Teen Tale Magazine arrives through the back door who happens be Wendy�s double; David quickly recovers from his depression as he and the reporter kiss. Eight years later, Peter Meyersen and James Komack joined ranks in crafting Welcome Back Kotter (ABC, 1975-79); sadly, Komack succumbed to heart failure in Los Angeles on December 24, 1997. He was 67. The violin rendition of Mendelsohhn's Wedding March heard here at the beginning of �The Prince And The Paupers�'s wedding sequence is heard again in Episode No. 30, �The Monkees In Manhattan� (a.k.a �The Monkees Manhattan Style�), in the scene where irate hotel manager Weatherwax (Phillip Ober) barges in on a married couple. The end credits read �Mary Mary� without the comma in the title. Another episode whose end titles miscredit the song is No. 12, �I've Got A Little Song Here�. Some of �The Prince And The Paupers�'s background musical cues are reused from the soundtrack of the series' premiere, �The Royal Flush�. Snatches from �The Royal Flush�'s underscore can also be heard in Episode No. 5, �The Spy Who Came In From The Cool� , the previous episode, �The Monkees In The Ring�, No. 28, �The Monkees On The Line�, No. 41, "The Card-Carrying Red Shoes", No. 50, "The Monstrous Monkee Mash", and No. 53, "The Monkees Race Again" (a.k.a. "Leave The Driving To Us"). Once again, Micky and Michael's hair are seen parted on the wrong side due to a flipped film negative. The first such occurrence was in Episode No. 17, �The Case Of The Missing Monkee�. The set of the dungeon where Prince Ludlow is held is reused as a Turkish prison in The Monkees' movie HEAD. For �The Prince And The Paupers�' reairings on CBS Saturday Afternoon, Jeff Barry's �99 Pounds� replaced �Mary Mary� on its soundtrack. A still from this episode was used as the picture disc for the 1995 Rhino release Greatest Hits (R2 72190). "The Prince And The Paupers"' director Jim Komack previously directed Clegg Hoyt for an April 9, 1963 episode of Combat (ABC, 1962-67), "Hill 256;" just like Oscar Beregi for the October 22, 1963 episode, "The Wounded Don't Cry." He would also direct Ben Wright (�The Success Story�) for the April 14, 1967 episode of Tarzan (NBC, 1966-68), "Man Killer" (#6000-31). A spoof of the classic Mark Twain novel, The Prince And The Pauper (1881). Every time Prince Ludlow's head is turned, you are actually seeing future KROQ-F.M. DJ Rodney Bingenheimer, who also doubled for David Jones in a lion's share of his personal appearances. Monkee stunt double David Price cameos as The Chemist. During his fencing duel with Max, David chants the following poem: "A voice upon the burning death / He didn't think he oughta / He took his shoes and stockings off / And his feet were in the water!....Longfellow!" Actually, this this wasn't prose composed by Henry Wadsworth Longfellow (1807-1882), but an original piece heavily inspired by Cyrano DeBergerac; in any case, David can be heard repeating its first stanza in Episode No. 40, "Monkees Marooned", when, along with Kimba (Burt Mustin), Thursday (Rupert Crosse), and his fellow Monkee mates, demanded to spit out his last words at gunpoint by Major Pshaw (Monte Landis). And speaking of Cyrano DeBergerac, Peter can be seen snatching a cue from Cyrano seranading Roxanne in Episode No. 13, �One Man Shy� (a.k.a. "Peter And The Debutante"), in the scene where he lypsynchs to Micky, Michael and David as he "serenades" Valerie Cartwright (Lisa James). David's fencing fatigues closely resemble those worn by Sir Twiggly Toppin-Middlebottom (Bernard Fox) in Episode No. 55, "The Monkees Mind Their Manor" (in the fencing duel with David at The Ye Olde Fair). Other Monkees episodes to deal with Monkee dopplegangers will be Episode No. 25, �Alias Micky Dolenz�, in which Micky doubles as himself and Baby Face Morales; the tail end of No. 41, "The Card-Carrying Red Shoes", wherein Peter doubles as himself and Alexi, Natasha Pavlova (Ondine Vaughn)'s new love; and the final minutes of No. 48, "Fairy Tale", in which Michael doubles as himself twice: one of him clad in medieval peasant gear, and the other of him disrobing from his Princess Gwen makeup. Prior to playing "Pattycake" with Peter in front of The Jailer (Clegg Hoyt), which leads to the latter being punched unconscious, Micky makes reference to the film Road To Morocco (Paramount, 1942) starring Bing Crosby and Bob Hope. Wendy Forsythe reveals to have run away at age 16 to take an apartment in Greenwich Village. Peter Tork spent a couple of his pre-Monkee years as a folk singer in The Village; he confesses that he'd even return to The Village to resume his folk career should his Monkee popularity be wiped out, in the closing interview segment of Episode No. 30, �The Monkees In Manhattan� (a.k.a �The Monkees Manhattan Style�). Number of times The Courtier breaks his cane: 4. Here, David merely masquerades as a Prince Of Moldavia; 14 episodes later, in No. 35, "Everywhere A Sheik Sheik", he is groomed to become a Prince Of Nahudi, via marriage to Princess Colette Yaduin (Donna Loren). This is one of several rare occasions of The Monkees punching people out. Others are the previous episode, �The Monkees In The Ring�, the beginning of the �Cuddly Toy� musical number in Episode No. 35, "Everywhere A Sheik Sheik", in which David gives Micky a light jab on the chin, and various sequences in The Monkees' movie HEAD. Notice that The Courier and Michael are seen wearing blue robes which are exactly the same. In the January 12, 1967 episode of Star Trek (NBC, 1966-69), "The Squire Of Gothos" (prod. #6149-18), its guest star, William Campbell, can be seen wearing that same blue robe in his role as Trelane. This is one of only 2 episodes of The Monkees in which David Jones is referred to as "Dave"; the other is the tag interview sequence of Episode No. 30, �The Monkees In Manhattan� (a.k.a �The Monkees Manhattan Style�). For the first time, Michael Nesmith delivers the line, "Yeah, I'm hip!" He repeats it in Episode No. 30, �The Monkees In Manhattan� (a.k.a �The Monkees Manhattan Style�), and No. 48, "Fairy Tale". The weekend following the first-run NBC-TV networkcast of �The Prince And The Paupers� (Saturday, February 11) found More Of The Monkees easily displacing The Monkees as the #1 LP on the Billboard chart. The late Oscar Beregi Jr. (Count Myron), son of silent film star Oscar Beregi Sr., is known for his frequent onscreen portrayals of a great many Nazis - including that of a Nazi Admiral in the 1964 Warner Bros. comedy classic The Incredible Mr. Limpett starring Don Knotts, and the role of Capt. Gunther Lutze in the November 10, 1961 episode of The Twilight Zone (CBS, 1959-64), "Deaths-Head Revisited," which also featured future Monkee guest Ben Wright (�The Success Story�). He later appeared in the March 30, 1973 episode of Mission: Impossible (CBS, 1966�73), "Imitation" (its last), with Monkee guest alum Ray Ballard (�The Success Story�) and Olan Soule (�The Monkees In Manhattan� [a.k.a �The Monkees Manhattan Style�]). Heather North (Wendy), at the time a major fixture as Sandy Horton on the NBC Daytime drama Days Of The Lives (she met and eventually married DOOL producer/director Wes Kenney), went on to provide the voice of Daphne Blake in Hanna-Barbera�s Scooby-Doo (CBS/ABC, 1969-86); the second actress to do so (the original being Indira Stefanianna Chstopherson). Surprisingly, 2 Monkees would have guest shot speaking roles in 2 episodes of the series; David Jones voiced himself in the CBS New Scooby-Doo Movie �The Haunted Horseman In Hagglethorn Hall� [61-15, 12/2/72], and Micky Dolenz voiced �Alex Cooper� in �Mamba Wamba And The Voodoo Hoodoo� [81-16], which was telecast on ABC November 6, 1976 as part of The Scooby-Doo/Dynomutt Hour. Clegg Hoyt (Jailer) and pre-Monkee guest Ned Glass (�The Monkees In The Ring�) appeared in an April 8, 1961 episode of Have Gun Will Travel (CBS, 1957-63), "The Long Weekend," and with another pre-Monkee guest, Arch Johnson (�The Chaperone�), in a March 10, 1961 episode of The Twilight Zone, "Static"; he later had a recurring role in Dr. Kildare (NBC, 1961-66) as Mac. Hoyt's appearance in "The Prince & The Paupers" was his final TV role before his death in October 1967 of a stroke; his final film role was in 1967's In The Heat Of The Night as a deputy to Rod Steiger and Sidney Poitier, a film that also featured Monkee guest alumni Peter Whitney, Arthur Malet, Eldon Quick, and Stuart Nisbet.